Any 50+ Convert to Single Speed? Curious if any Fifty Plus folks gave up the derailers and went to Singlespeed. Nope -- I love my gears. I am the guy who converted an old Swedish track back to a 4-speed freewheeler. I was going to build up a S3X hub based bike, but the project fizzled a bit. I still like my gears, and coasting every once in a while. Don't think I would ever do a fixed gear ride. Pretty flat here (where I live). I experimented with single speed back in my late 50's/early 60's but was disappointed not to see any improvement in anything from all that extra pain on the 10% climbs or spinning 135 on the flats. So I figured *** and went back to gears. I should note that singlespeed is not fixed gear, not at all. Singlespeed bikes have freehubs and one can coast. I didn't give up my derailleurs - but I've had a fixed gear in my stable for 15 years... on my 4th one. Right. Most riders don't give up on gears. Even the FG/SS forum here has a thread "post your geared bikes". Three and a half years ago I bought my first FG bike. Ended up loving it, bought another, and also converted an 80's road bike to FG/SS. I still ride gears when I feel like it. Single speed = almost useless when you live 1/2 way up a mountain, even a small one. I have my 86 Gazelle built up as a fixed gear. I've done almost 60 fixed gear miles over the last two evenings. I don't ride exclusively fixie, but it's in my stable. I did a singlespeed from spare parts a couple years ago. It was a lot of fun to build, the simplicity was appealing, and it was nice and light (relatively speaking). Going in to the wind was a challenge, and spinning down wind at 200rpm was crazy. Ultimately I decided to switch to a 1x. I'll just have to try it to see. The idea of it is real appealing, and again it's pretty flat land where I live. Last edited by dregsfan; 07-12-18 at 11:45 AM. I've ridden both geared and fix gear the past 40 years. My lifetime mileages of each are roughly the same. I do about 60% fix gear these days. (Singlespeed has no appeal to me. I rode the bike that became my first fix gear ride for 3 years before singlespeed. After the first fix gear ride (on which I tried to coast and crashed painfully) I never rode a singlespeed again. I was 22 yo then, 65 now. I rode an easy 50 miles geared Sunday and a considerably harder 45 fixed last night. But I'm not really that into mountains. And I used to break all manner of brake cables and had derailleurs shift themselves long before the 'Autobike'. I am simply bad for Panasonics, Paramounts and Peugeots so I swoon over them from afar. PS If you have an unfortunate injury, Invacare chairs etc. are made by the former Colson company so you too will be 'riding vintage'. 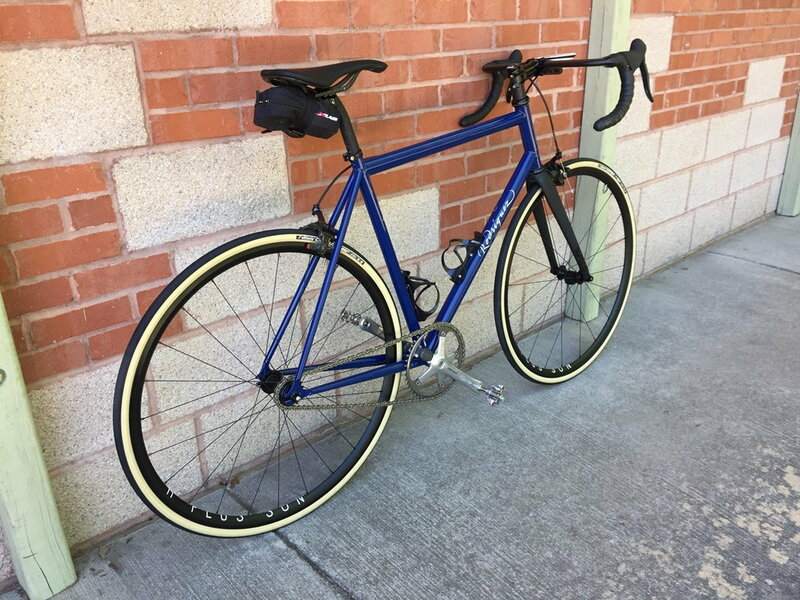 Built up a fixed gear bike a few months ago, my first, at 56. I had a road bike in my teens with a frozen freewheel that was essentially the same thing, but this is my first real gear fixed bike. It's flat around here, so you could easily do 100 mile rides on a fixed gear, your only variables are the wind. I did a 30 miler yesterday fixed, part of it with the wind, part against. It's quite a workout. What gets me most is that when I give everything I have, to sprint really hard for a traffic light, there's no coasting when I'm through the intersection. I think it's a much better workout when you can't coast. These bikes are dangerous too, I crashed a week ago when I hit an unseen dip in the road with my front wheel, with my pedal down. My instinct was to level out the pedals and hop over with the rear wheel, I fought the fixed gear and went down hard on my hip and slid a couple feet, didn't even get out of the pedals. I was lucky I wasn't injured worse, but it hurt like hell to go down like that, it was a semi-replay of one of my worst crashes ever, that happened when I hit a rock in the road a 25 mph in a paceline and my hands flew off the bars, and I went down on my side, really hard, without the chance to brake. Riding a FG for winter base miles has been a staple of my season for decades, riding a FG century every autumn a feature of the last several years. Not for everyone and distinctly Old School. Yup, I'm 54 and have been riding/training/racing/commuting fixed almost exclusively since 2004. I believe I will pretty much continue that through my grandpa years. I put in between 5-6k/yr and do all my Centuries and 200k Brevets fixed. I live in Chicago albeit those longer rides (Wisconsin/Michigan) can be very hilly at times. I run a big gear (54x16) when I train but that works for me. Huge fan. 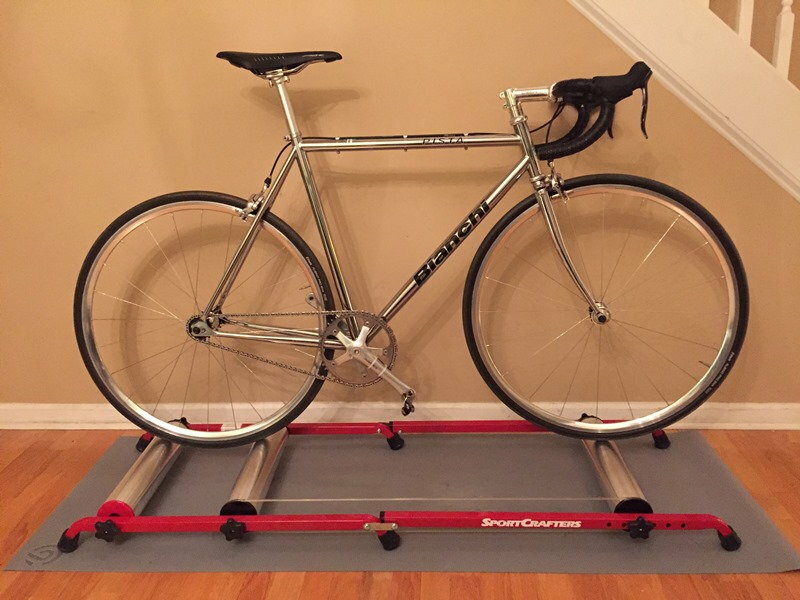 For those looking for a change or looking for ways to get stronger/faster on a bike, this is one of the answers for sure. Give it a shot. Bianchi Pista purchased at age 51. The freewheel came off immediately and I haven't looked back. It is now highly customized. Custom frame by Rodriguez in Seattle purchased at age 54. This bike is built up specifically for road riding. 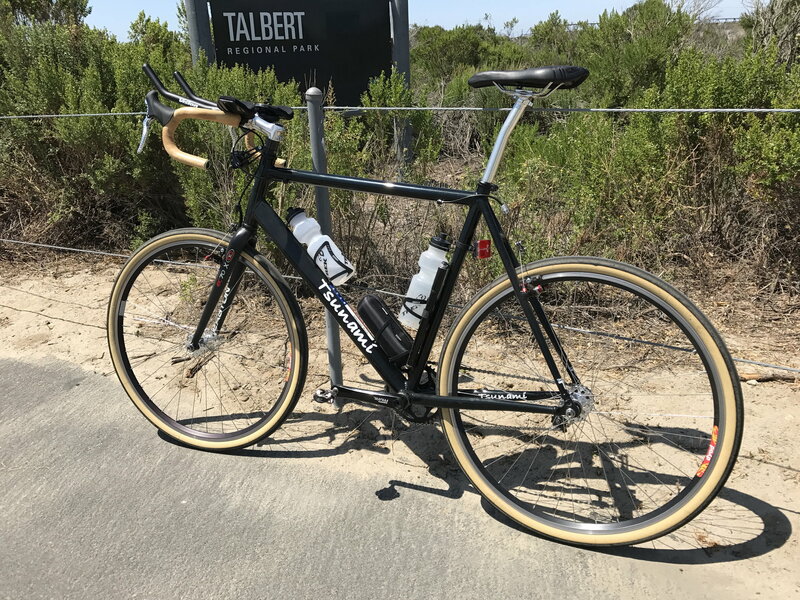 I did a 68 mile ride this past weekend and will be doing a fixed gear century in a few weeks. I also have geared gravel and road bikes. These replies are just great. Inspiring. The bikes are beauties. Something about the looks of SS's. Thanks again guys. Appreciate it. Built a single speed commuter for my six mile flat commute two years ago at age 53 and ride it to work five days a week year round. Ditched derailleurs on my touring bike two years before that for an internal gear Shimano alfine 11 hub, which I've loved for about 10,000 miles. Turned my wife's 3x8 into a 1x10, and she loves it. I don't hate derailleurs, but I'm thrilled with my bikes and our derailleur-lite family stable of bikes.. I do have a single-speed, but I prefer fixed. I'd heard of "track bikes" before, but never tried it until 10-12 years ago. I was in my mid-40's, and the craze hadn't taken off yet. The guy who owns a LBS recommended I try it. First I just picked a gear on my road bike, and went for a ride without shifting or coasting at all. I decided he was insane. But then I found Sheldon Brown's site and taught myself how to convert and ride old road bikes (hence my screen name). I figured out the best gearing for my hilly area and made some cool bikes for hardly any money. 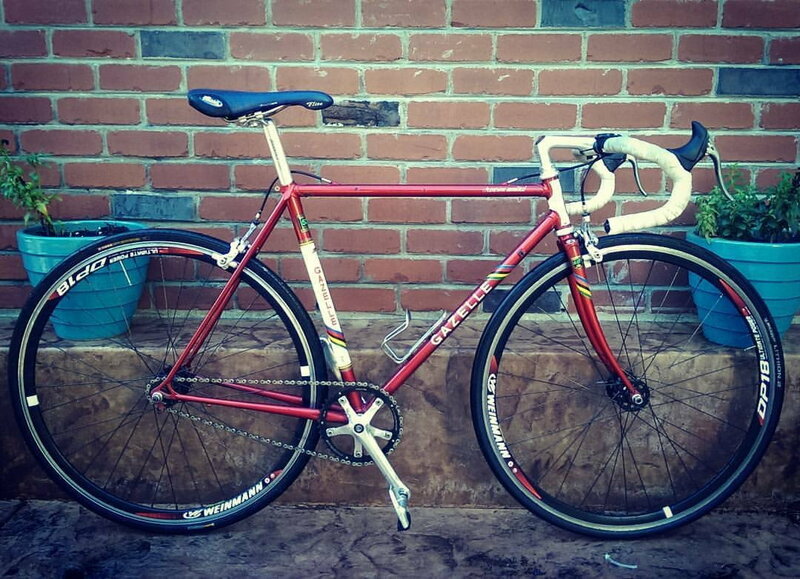 Now I have an older, renovated Bianchi Pista and a Nishiki I converted to single speed. Riding fixed is less relaxing and more strenuous than I want to do all the time, but it's 1/3 to 1/2 my miles. I love the simple elegance, but gears have their place in hilly terrain, going fast, or on group rides. I'm well over 50 and 3 of my 10 bikes are SS (I tried fixed for a year but concluded it was somewhat juvenile and not suited for the topography where I ride). I fail to see any connection whatsoever between riding SS and being older. Big disconnect. I don't understand how anyone can conclude that fixed gear is juvenile. On the contrary, I find it to be simple, elegant and quite natural once one learns not to fight the bike. I'm going out on mine tonight.